Last week Shelby had several implements spread out before her. The legs off her dollhouse piano, a dollhouse lamp, a comb, a mirror ... she told me she was doing her makeup, that she had to get ready. Me: What are you getting ready for? 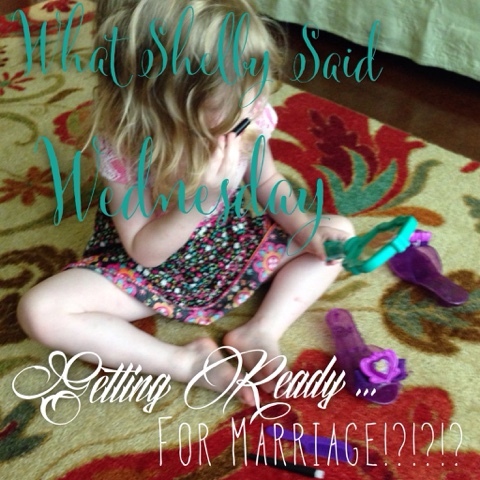 Shelby: I getting ready for married. Me: How exciting! What are you doing? Shelby: I have to put on my makeup. I have to get ready for married, cause we have to get more money. Me: [after a moment of stunned silence] Sweetheart, you know you don't marry someone for money, right? Where did you hear that? Shelby: No I getting married cause I WANT to. I'm still stupefied. Where on Earth has she heard such a thing? As far as I know her concept of money is that when she finds some on the ground we put it in her bank, and we have to use it to buy things. Imagine my relief a little while later when she was putting some babies to bed and reading the story of Jesus' birth. Whew. Do your kids every say something that shocks you? Something you'd never have taught them?